Sometimes a squirrel on the roof is using the roof as an access point to get into your attic. If so, go to the home page to read about how to solve this problem. If you simply have squirrels running around on your roof or even nesting on the roof, that might not be much of a problem, unless you object to the noise. In that case, your best option is to trap and remove the animals. What to do about the squirrel on the roof? Squirrels are lovely to watch. They are cute little creatures with big eyes and big fluffy tail. They play around the trees and houses, on the roofs and ceilings. Squirrels are the members of rodent families of animals. They have sharp nails and teeth. They are quite aggressive, when sense danger they can cause destruction. But sometimes they do coexist with the humans. They eat fruits and nuts. And sometimes eat worms to. They make their nest high on the trees. Squirrel’s babies can be kept as a pet for the starting six months from their birth. However when the babies are kept as pet, they can’t be sent back to the wildlife. But they can change their behavior. They can learn new behaviors. They also show affection to the human if they keep them as a pet. 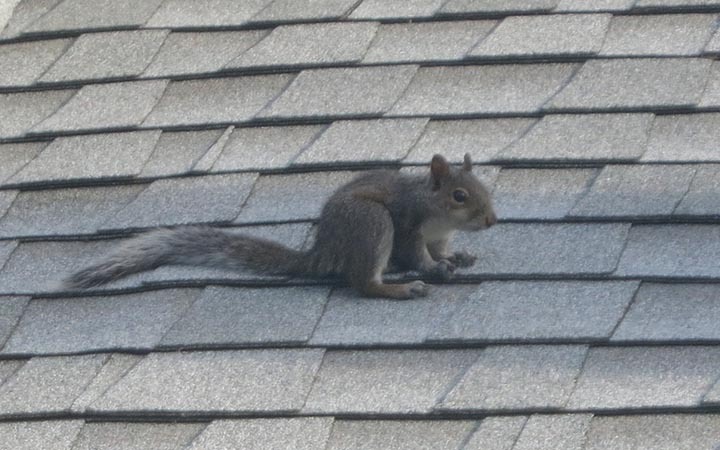 A squirrel if stuck on the roof can be very aggressive, and cause harm to the humans nearby. Because of their sharp nails and teeth, when setting free will bite the person in aggressiveness. First step, that should be, is to seal all the entering points of the house so it don’t get into the house, because it can cause devastation. Because it is not that artless to get rid of a squirrel on the roof. You obviously don’t want them to get into your house. Knowing about their food timings can be helpful. You can get them away when they are searching for the food. Squirrels can come into the house through the hole on the roof. So make sure that it is closed. You can use field glasses to watch a squirrel on the roof to keep an eye on it. Then just figure it out whether the squirrel’s babies are around, because there might be a baby around for which a mother squirrel are looking for. Squirrels like to sleep in a peaceful place. So for making the squirrels get away from the roof you can use some sound system. It will make the squirrel go away. You can also use light on the place where squirrel is. Some people use shooting guns to make them run away, which is totally inadvisable. You can miss the shot and hit someone else. Shooting them is also harmful for the squirrels. It can cause serious injury. Removing the squirrel from the roof can sometimes cost you some dollars, for trapping and tricking the squirrels. Going near the squirrel on the roof is not recommended. It can cause injury to the person. All protection measures should be taken while dealing with a knotty and aggressive squirrel. There piercing nails and teeth will rip off your skin which will start bleeding immediately.